Ronald K.L. 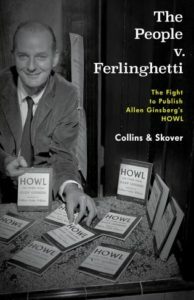 Collins and David M. Skover discuss the subject of their new book The People v. Ferlinghetti : The Fight to Publish Allen Ginsberg’s Howl published by Rowman & Littlefield. The People v. Ferlinghetti is the story of a rebellious poet, a revolutionary poem, an intrepid book publisher, and a bookseller unintimidated by federal or local officials. There is much color in that story: the bizarre twists of the trial, the swagger of the lead lawyer, the savvy of the young ACLU lawyer, and the surprise verdict of the Sunday school teacher who presided as judge. With a novelist’s flair, noted free speech authorities, Ronald K. L. Collins and David Skover tell the true story of an American maverick who refused to play it safe and who in the process gave staying power to freedom of the press in America. The People v. Ferlinghetti will be of interest to anyone interested the history of free speech in America and the history of the Beat poets.